"Bear witness once again to its unprecedented success, altering the dynamics of Hollywood blockbusters for generations"
Predator is a 1987 science fiction horror, directed by John McTiernan. It stars Arnold Schwarzenegger, who leads an elite special forces team on a mission to rescue hostages held by guerrillas at Val Verde in Central America. Kevin Peter Hall is the titular antagonist, an extraterrestrial life form which stalks and hunts people down. Initial reactions to the film were mixed. However, in the years to follow attitudes changed, and it appeared on a lot of "best of" lists. During filming both McTiernan and Schwarzenegger lost 25 pounds. It was physically taxing on Arnold Schwarzenegger, as he would swim in cold waters and had mud spread all over him for a period of three weeks, whilst the battle scene with the alien was carried out. Schwarzenegger also had to engage with Kevin Peter Hall, whose sight was obscured inside the suit. Hall in an interview states ".. it was a survival story for all of us.” The original development of the monster saw it having large yellow unweildly eyes, with a dog-like head. Close to earth a spacecraft flies, letting out a bright object in to the atmosphere. Major Alan "Dutch" Schaefer and his team are situated in the Val Verde jungle, who have been set the task by the CIA of rescuing an official who is being held hostage by insurgents. George Dillon, a CIA agent, liaison and former US Army Colonel, as well as an old friend of Dutch’s, is asked to handle the team despite Dutch being somewhat opposed to it. The team locate the remnants of a chopper, which inside holds three skinned bodies. Dutch specifies them as a unit of the U.S. Army Special, whom he knew. Dillon, when cornered by Dutch admits to it having been strategically planned, with the view to obtain intelligence from operatives who have been captured. After a guerrilla named Anna is caught, the unit are ill informed of the fact they are being monitored by “thermal imaging,” or rather, an invisible observer. But who could this be?.. To locals what later comes to be known as a “creature” is referred to as "el demonio que hace trofeos de los hombres" ("the demon who makes trophies of men"). The deep hypocrisy of the film is that it first establishes the guerrillas as evil, only to then permit the “expendables” squad free rule over their cold-blooded murder shortly after. If that doesn’t bear a reflection on the Reagan era, then I don’t know what does! Intermittent moments of self-consciousness are also evident in the film, and the play back of Carl Weather’s CIA Agent, Dillon saying to Duke (Schwarzenegger) “any time,” made by the monster, is a prime example of compelling screenwriting. The final image of the film would appear to say that there is always someone bigger than us. 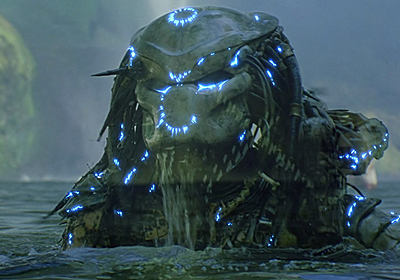 The Hunt is Back on: PREDATOR Stalks Back to the Big Screen this November. Bear witness once again to its unprecedented success, altering the dynamics of Hollywood blockbusters for generations. At the same time inspiring every caliber of filmmaker , and feeding in to the rise in popularity of the horror-action genre.